This large assemblage piece was built over a period of three and half months and was featured in Cloth, Paper, Scissors magazine and was part of the Fine Art Exhibition at the 2018 Washington State Fair. The inspiration for this piece was the song Pandemonium by the Pet Shop Boys, with the lyrics of the song revealed beneath the windows created with the harlequin and flourish stenciled areas of the background. Richly textured using a variety of mediums, the background was then slowly colored with multiple washes of metallic paints and mica powders. 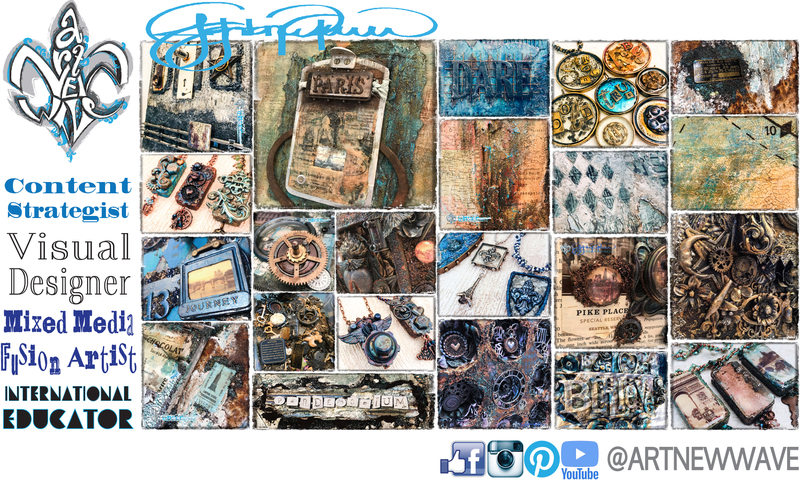 This piece is embellished with a variety of found objects including vintage prints transferred onto metal (then set with resin), an antique Parisian key (hand beaded), antique door handle with a mercury tube serving as the handle, vintage train track piece and more. This stunning piece reveals a new treasure every time you look at it! The canvas is mounted onto a piece of salvaged corrugated metal and measures 25 x 30 inches in size. Shipping within the United States Total price shown includes Shipping and Handling Costs. Note that a discounted price is available for local (Seattle area) delivery – please send an email for inquiries. Shipping outside of the United States Additional shipping costs of $100 will be billed in addition to the cost shown for this product via PayPal request. Product will not be shipped until this has been paid within 3 business days of initial order date.